April’s Camp NaNo is in its last week. I passed 43k on Sunday so I don’t anticipate any trouble reaching my goal of 50,000 words. I’m still doing well in totally pantsing this new story. (book 2 of the Zoe Ohale series, currently titled Troubled Campus.) I have to get Zoe into the final conflict then tie up all the loose ends. Perhaps another 5 – 8 chapters. We’ll see how that goes. I still have no idea how to make that happen. I’ve been working on the edits of Mystery at the Book Festival. I’ve finished 16 chapters so far. This editing and rewriting is a totally different skill set. I have to stay focused tightly, on what has happened so far, on every question I ask that has to have an answer and continuity. It’s a lot of work and slow going. Totally unlike writing the first draft of a story. Some authors say the editing is their favorite part of producing a book. I wouldn’t go so far as to say that but it’s not too bad if I don’t hold too tight to things that need to be cut or at least, rewritten. I went into my Elf Slave story to post part three and it’s gone. The draft has only parts 1 and 2. Ugh. Now I have to write both my Zoe story and at least part 3 of this one. Thank goodness they’re different genre’s. I don’t think I’ll get too confused. Gardening: The roses are Blooming. Last week I talked about everything I planted. So far the only thing coming up are the flower seeds I forgot to mention. Everything else is taking it’s time popping up. I’m nervous about the bonzai seeds. Nothing seems to be happening. I’m being impatient, I know. This last week I trimmed the dead apple tree, reserving the tiny tree that’s popped up from the root stock. It’s an experiment that will take at least five years to see what kind of apple I’m going to get. I also trimmed the root stock sprouts on my D’anjou pear tree and the peach tree. One large branch seems to have bent over, the top touching the ground, in the last big storm. I’ve decided to leave it. I’ve been picking peach buds off of the tree leaving just one at intervals so they will get large. Leaving all the clusters together means the peaches stay small. Also, it thins them out so the branches don’t break under the weight of all that fruit. There are a lot of buds remaining after the thinning. I’m looking forward to having a bumper crop this year. I know so many great authors, it’s always hard to choose who to feature. I think this time I’ll brag up the Phoenix Comicon. You can see their link below. 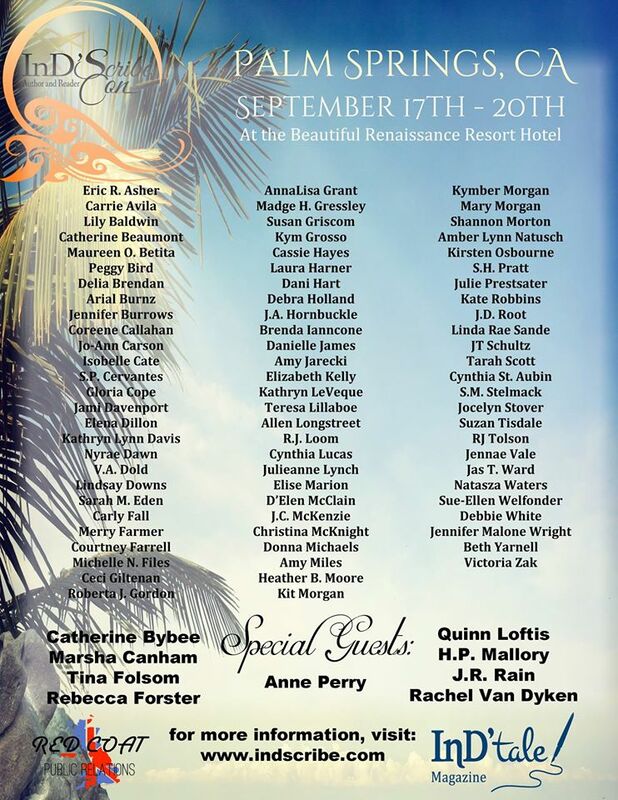 But what’s great is that the conference features authors, writers, and creators of all kinds. SciFi, Fantasy, TV shows, Graphic Novels, Costume designers, it’s a free-for all, you people. Really! I took a look at the schedule with the fancy new PhoenixComiCon app (Google Play Store). It is just packed, every day, with presentations, demos, panels, it’s mind boggling. If you can come, you should. It’s going to be fantastic. I have contracted for a booth at Phoenix ComiCon with some other author friends. The ComiCon is May 25 – 28th and you can find details for tickets, events, special guests, at http://phoenixcomicon.com/. I would be so excited to see you in the Exhibits Hall in the Four Carat Press booth number 1797. I’m back from the MysteryCon in Scottsdale. We had a good time Friday evening with an author signing. Lucky us, we were right across the lobby from the Happy Hour so a lot of people came in and talked with us and I even sold a few books! Yay! A lovely young woman won the first bracelet on Friday night. Saturday was more about presentations with the book selling room opening from noon to four, when the con was over. I had a lot of fun getting to know the other authors and met a few that are scheduled to come to the July Payson Book Festival. I have a lot of swag and won 2 bottles of wine! On my second bracelet? No one signed up for the giveaway. That’s okay. I have it for the book festival. Now it’s time to get some books ordered for July. The Spring Into Reading giveaway closes in about 10 days. I have links to it on my facebook, twitter, and website pages. This giveaway I offer a free ebook or for second prize, a $5 Amazon card. There are other prizes as well. Over a hundred prizes plus a grand prize. It’s not hard to enter and there are multiple ways to enter. You could easily win a prize. If you haven’t entered yet, please enter today and every day. Last week I bought some hot and sweet green peppers and put half in the garden the day before I left for MysteryCon. Bad time to plant, it’s been 99 – 100 degrees here (it was 115 in Phoenix!) but when I got home, the plants were mostly fine. I suspect chipmunks, one has been investigating my back yard for the last couple of weeks, ate my hot chili pepper plants! I hope they got heartburn. Anyway, the little buggers left some stem and leaves so maybe the plants will recover. The soil was bone dry when I watered Sunday morning so I watered heavily and planted bean (pole string and yellow beans), butternut squash, and Swiss Chard. I suspect I’ll have to protect the seedlings when they pop up. Birds, especially like sprouted bean seeds. So now the garden is fully planted. The tomatoes I bought from the garden club are doing fine, blossoms and tiny green tomatoes are evident. The zucchini I bought has lost the tiny zucchini and the original leaves but new leaves and blossoms are evident so I just have to wait a little longer. How’s your garden doing? Click here to sign up for my newsletter. I’ve put sign-up prizes on both the regular and the Brown Rain newsletter sign-ups. That’s right. If you sign up for my newsletter you get a free story from me. My next newsletter is being drafted so sign up today. Be prepared for fun and contests! Click on the video link for a short video from me. Hear what I’m working on. I’d love to see you there. I’m in the middle of the Zoe Ohale re-write. If you’re a Brown Rain Series fan, I think you’ll like Zoe Ohale. Just 17, Zoe has been an orphan living on the streets of Baia Mare since she was 12. Street smart and fiercely independent, Zoe has been offered the chance to move back into legal society by the police officer that arrested her a few months ago. But first, she has to help protect the little kids in her group, help her friend save her father from assassination, and find a criminal ring that just stole all of the physical credits being delivered to the Planetary Bank of Baia Mare. The book, the first of a series, should be out in August, if I can find time to work on it between the Book Festival and the Fair.